We’re entering the birthday season. And it could be big for wildlife. Here’s why. July through September is the leading three-month period for when babies are born in the U.S. 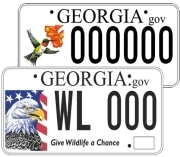 In Georgia, eagle and hummingbird wildlife plates are the leading fundraiser for conserving nongame wildlife. And, in almost all Georgia counties, registering your vehicles coincides with your birth date. So, more birthdays, more potential for wildlife tag sales and annual renewals. Now this is where you come in. Upgrading to the new flying eagle tag or renewing your current eagle or hummer plate costs only $25 more than a standard peach plate. 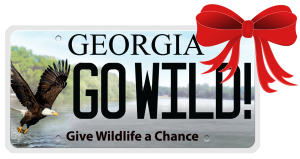 Even better, $19 of each purchase and $20 per renewal goes directly to conserve Georgia wildlife! This birthday, treat yourself to a wildlife tag. It's like having your cake and eating it, too. More ways to support conservation. 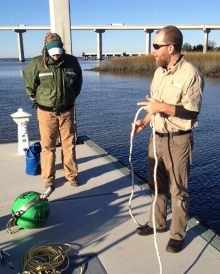 The second installment in a series on invasive species in our state. With their variety of colors, shapes and textures, exotic plants have taken root in the yards, and hearts, of many Georgia gardeners. Unfortunately, not all exotics stop there. Those that escape cultivation and spread rapidly into the surrounding environment can cause devastating and long-lasting damage. Displacing native species and destroying the critical habitat they need, exotic invasive plants are one of the biggest threats to our natural heritage. What can you do? Grow native! Help reestablish native plant populations in your area and stop the introduction of potentially harmful exotics by choosing native species for your lawn and garden. Many of Georgia’s most destructive invasive plants, such as Chinese tallow (below) and kudzu, started as exotic imports for use in landscaping and gardening. Not all non-native or exotic plants are invasive, of course. Many, like the crape myrtle, are easily controlled and have existed in the state for centuries without issue. But the effect of exotics on the natural environment is not always readily apparent or easily predicted, according to Dr. Mincy Moffett, a DNR botanist and Georgia Exotic Pest Plant Council board member. Also, past performance is not a reliable indicator of future behavior. 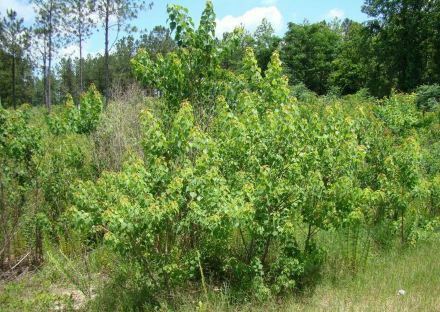 Read more about Georgia's war on invasives in this post, including native alternatives and where to find them. Up next month: part III: controlling the invaders at all cost. Also check out part I: We have seen the enemy. Native plant recommendations from the Georgia Exotic Pest Plant Council. 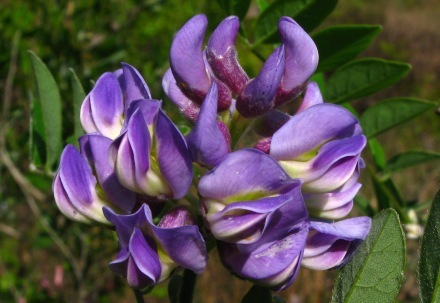 National directory of native plant suppliers and related resources. USDA guides for identifying and managing invasives in southern forests. Native landscaping in the coastal region (Coastal Wildscapes, Georgia Native Plant Society). Native plants guide for Georgia gardens (UGA Cooperative Extension Service). Thanks to Jurassic World, Georgians are again fascinated with dinosaurs. And although the thunder lizards have been extinct for eons, their distant relatives still lurk nearby. Yes, if you live anywhere in the Peach State except extreme northeast Georgia, there is a good possibility the lizards in your yard are green anoles. It’s hard to believe that the small, fragile green anole is a relative of dinosaurs, but it is. The male green anole is roughly 8 inches long. Females are about an inch shorter. That’s a far cry from some of the dinosaurs that measured more than 60 feet long. 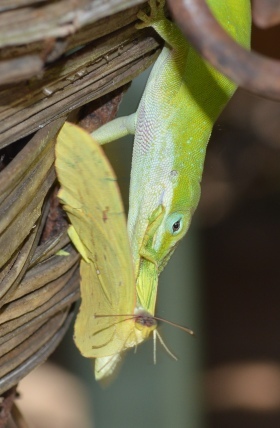 Read Terry’s column on green anoles, including why they aren’t chameleons, how to find them in your yard and what happened when one Terry was watching attacked a butterfly. Terry W. Johnson is a former Nongame program manager with the DNR and executive director of TERN, the Nongame Conservation Section's friends group. Out my backdoor library. Strong loggerhead sea turtle nesting has scientists predicting 2,500-2,800 nests this summer, a total that would shatter the state-record 2,289 set in 2013. 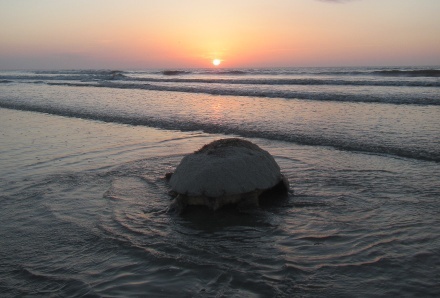 As of July 5, two weeks past the season’s midpoint, monitoring by the Georgia Sea Turtle Cooperative marked loggerheads more than 200 nests ahead of other big years. Also July 5, the first hatch was recorded on Ossabaw Island. About 30 clutches have hatched since, and the nest count has topped 2,000. Updates. A Brunswick man who stole sea turtle eggs from Sapelo Island two years ago has been caught again. DNR rangers arrested Lewis Jackson Sr., 61, on July 8 as he left the Sapelo ferry with 67 loggerhead eggs. In 2013, after pleading guilty to stealing 156 eggs, Jackson was sentenced to six months in prison, two years of probation, 156 hours of community service and a tour of the Georgia Sea Turtle Center. The deadline has passed to comment on the revised State Wildlife Action Plan, but stay tuned to Georgia Wild or subscribe for email updates to follow the progress of the comprehensive strategy that guides efforts statewide to conserve our native nongame wildlife and habitats before they become rarer and more costly to protect. Turnout at three public comment meetings this month was slim. The public also is encouraged to weigh in on a DNR Wildlife Resources Division initiative to simplify its sporting license fees structure, an effort that includes a proposed fee increase. Following an initial online survey and seven public forums, a more in-depth survey is available at www.georgiawildlife.com/aimforsuccess. DNR Wildlife biologist Clay George (far right) has earned the National Marine Fisheries Service’s Team Member of the Year Award. George, who leads DNR Nongame Conservation Section’s work with North Atlantic right whales and other marine mammals, was recognized by peers at the federal agency for his "contributions to the nation toward the stewardship of living marine resources." A 2015 version of the Landowner's Guide to Conservation Incentives in Georgia provides a concise overview of conservation programs, qualifications and contacts. View or download a copy, and learn more by contacting forester and guide editor Steve Raper of the Nongame Conservation Section. Like fishing, photographing and winning? Enter the DNR Wildlife Resources Division’s fishing photo contest on Facebook to land Bass Pro Shop gift cards provided by the Georgia Natural Resources Foundation. Red-cockaded woodpeckers at Silver Lake Wildlife Management Area near Bainbridge produced an estimated 40 young this year. Nongame Conservation Section surveys documented that 19 of 22 family groups of the endangered birds successfully nested. A controlled burn recently at Moody Forest Wildlife Management Area covered nearly 170 acres. Jointly managed by DNR and The Nature Conservancy, much of the uplands at this area near Baxley are being restored to longleaf pine/wiregrass habitat through prescribed fire and selective thinning. 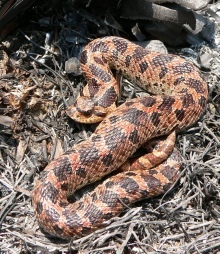 Ten reptile and amphibian species petitioned for Endangered Species Act listing in 2012 will require further research to determine whether protection is needed, but five others won’t be listed. Of the Georgia species included, the U.S. Fish and Wildlife Service determined the Center for Biological Diversity didn’t provide enough information to warrant listing the pigeon mountain salamander, while a 90-day finding – a first step in assessing the need for listing – is in order for the alligator snapping turtle, gopher frog, green salamander, southern hognose snake (right) and spotted turtle. July 29-30 – International Bog Day event, Cedar Mountain, N.C.
Georgia Wild copyright © 2015. Wildlife Resources Division Nongame Conservation Section. All rights reserved.